New York (TADIAS) — Hydropolitics flare up is not new to Africa’s Nile Basin region. The world’s longest river, which flows northwards and criss-crosses eleven countries, has been a particular point of tension between Egypt and Ethiopia for a long time; especially when it comes to the equitable sharing of the water resource for economic development. In 1959, the colonial-era Waters Agreement between Egypt and Sudan was signed before all the upriver countries had achieved independence — namely Tanzania (1961), Uganda (1962), Rwanda (1962), Burundi (1962), and Kenya (1963) — excluding Ethiopia from the deal. Emperor Haile Selassie who was incensed by the snub, responded by ending the Ethiopian Orthodox Church’s 1,600 year relationship with the Egyptian Coptic Orthodox Church in Alexandria. According to a newly launched historical data visualization web site, TimeLine Ethiopia, the colonial era agreement had allocated 55.5 billion cubic meters of water annually to Egypt while Sudan was given 18.5 billion cubic meters, which represented 99% of the average annual flow of the Nile river. That same year Haile Selassie decided to commission a $10 million American-led study entitled “Land and Water Resources of the Blue Nile Basin: Ethiopia.” The seventeen volume report finalized in 1964 served as the blueprint and beginning of Ethiopia’s mission to build multiple dams on the Blue Nile and its tributaries. 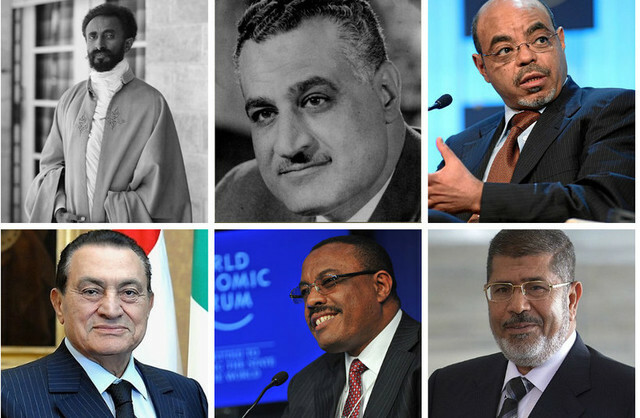 Fast forwarding to current times, when Ethiopia’s former Prime Minister Meles Zenawi re-initiated the project to accomplish unrealized ambitions for Ethiopia, Egyptian President Hosni Mubarak, did not welcome the effort. In 2013 Ethiopia’s diverting of waters to complete the Grand Renaissance Dam project has been met by high-level Egyptian agitation including discussions of sabotage on live television. Below is an interactive timeline of the Nile dispute courtesy of TimeLine Ethiopia.